The siddha babas of Braj are not easily recognizable, and rightly so, as they shun name and fame, giving their devotion and precepts only to the qualified. OBL Kapoor personally met and collected information about hundreds of siddha devotees of Braj – persons whose attachment to the Supreme far outweighs any lingering attachment to the body, to the extent that it is often difficult for them to survive in this world. Hearing about their pastimes is awe-inspiring and might even help us to recognize the rare soul who is siddha. For the modern striving devotee, the stories of the devotees of the modern age is very useful. For this reason, the stories of the lives of the devotees of approximately the last two hundred years have been collected." Kapoor later released an English edition of Braj ke bhakt, called "The saints of Braj". In the chapter on Shri Gauranga Dasa Babaj, Kapoor describes how he used to come to Vrindavan in search of a siddha Mahatma – a great soul who is directly in touch with the Supreme. "After my spiritual master Sri Srimad Bhaktisiddhanta Saraswati Goswami Maharaj had passed away, I was in great distress. Though I knew that his benedictory hand was still on me, I felt that without his living presence, I was like an orphan. There was no one to whom I could go to for succour, guidance or inspiration. My wife was in greater distress because she had only received Harinama from him. She was to be given proper initiation on some auspicious day later. But he passed away before that auspicious day came. We used to go to Vrindavan in search of a siddha Mahatma, whom we could accept as a spiritual guide or guardian. Once I asked an old saint in Vrindavan, "Is there any siddha saint in Vrindavan at present, a spiritual dynamo, to whom one could go to charge his battery whenever it became weak or discharged?" "Of course he replied, Have you not met Sri Gauranga Das Baba ji Maharaj of Ramanreti?" "Then what have you been coming to Vrindavan for? He is the only siddha saint in Vrindavan at present. He is most unostentatious and humble. But the spiritual treasure behind his simplicity can hardly escape the eyes of a discerning sadhaka. You must go and see him." My wife and I went to see him the same evening. We saw a fair coloured, attractive looking sadhu of about sixty, sitting all alone in his room and doing japa. His eyes were wet, his face was radiant and a heavenly peace seemed to reign on and around him. It appeared from his eyes that love, which filled his heart up to the brim was spilling out through the eyes. He cast a tender look at us, as if to draw us close to his heart and give us a loving embrace. We felt that we had found the guardian, the great saint we were looking for. Our hearts melted and tears began to stream from out of our eyes." Baba could understand that we were in distress. He said affectionately, "If there is anything that afflicts you, do not worry. Go and tell your tale to a kalpataru over there (he pointed out the Neem trees in the ashram). Every tree in Vrindavan is a kalpataru (desire tree). If you embrace it and speak out your heart to it, it listens and helps. There is nothing it cannot help you with. It can even present to you the most cherished objects of your heart – Radha and Krishna, if you so desire." My wife said, "Baba, if I go to a kalpataru, there is only one thing I shall pray for. I will say – Give me the guru I want. But since I have found in you the guru that I want, why should I go to the kalpataru and not pray to you directly? Would you not kindly give me diksa and accept me as your sisya?" "Lali, you are mine," replied Baba affectionately. "And what about me Baba?" I asked excitedly. "You are both mine," said Baba, looking at me with deep affection. "But Baba, I am already initiated by Shri Srimad Bhaktisiddhanta Saraswati Goswami Maharaja." "So what? He is your diksha guru, I am your siksa guru. You should regard the diksa guru and siksa guru as one. My problem was solved. Baba gave me the best of his love and blessings and in the few remaining years of his life I remained in close contact with him." "Have you come across a siddha vaisnava saint?" "Yes I have. 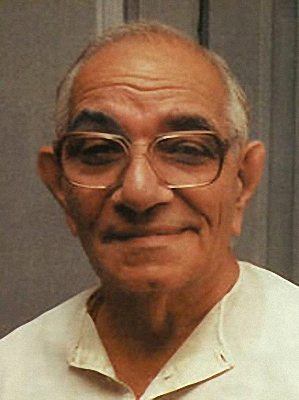 Have you not heard of Sri Rama Dasa Baba ji Maharaj? He is the only siddha vaisnava I have known. I have seen such asta satvika bhavas appear on his body at the time of kirtana as I have never seen or heard anywhere else. Rama Dasa Babaji is the disciple of Sri Radharamana Charana Dasa Baba ji Maharaj, whose miracles, like making a tree dance in Sankirtana, bringing back to life a corpse ready to be burnt on the funeral pyre, granting Krishna-prema to people by his mere embrace and many others, are well known all over Bengal and Orissa." "Your Gopala does not do any bhajana. He only loiters around like a lunatic." Jagadisa Dasa replied, "What Gopala does is the bhajana of the highest order. He cannot do anything except bhajana." Jagadisa Baba sent Dhirendra to study the shastras and Braj Bhasha literature under the guidance of Pandit Ramakrishna Dasa Baba, the sent him back to his Diksha guru in Calcutta, who gave him Sanyasa Diksha. After this time he was called Gauranga Baba. Gauranga Baba lived very simply by begging in a village in Bengal. One day he had a dream that Giriraj was calling him and saying "Take me to your Kuti. I long for your service." The next day, a Deity came out of the ground where some people were digging a well so Gauranga Baba started serving the Deity in his hut. Gaurange Baba had to spend all his time in serving Giridhari, so he had hardly any time left for lila smarana. He then returned to Vrindavan to ask Jagadisa Baba what he should do. "A lower end has sometimes to be sacrificed for the higher. Sanatan Goswami and Gauranga Dasa Baba ji sacrificed lower service of the Deity with the physical body and meterials on the mundane plane, to a higher service with spiritual body (siddha deha) and materials on the transcendental plane in smarana." "Vrajamohana Dasa Ji of Yasohara, who, after taking vesa from [Sri Krishnacaitanya Dasa] Baba, lived in Chandrasarovar and served him, once asked for instruction in lila smarana. Baba expressed in this connection the views of two great saints of his time who had become siddha through lila smarana. He said, when Pandita Ramakrishna Dasa Baba lived in Balapokhara in Govardhan, I went to him and asked for instruction in lila smarana. He replied, ‘If anyone else had asked me to give him instruction in lila smarana, I would have given him a slap on the cheek.’ I understood what he meant and did not have the courage to say anything. Lila smarana is not easy." Once two devotees went to Jagadisa Dasa Baba of Kalidah and requested him to give them instruction in lila smarana. Baba talked about other things, but did not say a word about lila smarana. They went again after a few days and made the same request. Again they returned disappointed, because Baba parried all questions regarding lila smarana. Then they began to practice lila smarana after taking instruction from another mahatma. Next time when they went to Baba, they found that he knew everything about their bhajana without their telling him anything about it. He asked with a smile, "How is your smarana going on?" "It is going on, but not very satisfactorily", replied the devotees. "On the tenth day all the Vrajabasis and Mahatmas, who lived within fourteen miles of Chandrasarovara, were invited to a grand feast. All arrangements for the feast were completed. Then suddenly Baba breathed his last. Festivity was over and dark clouds of grief and dismay cast their shadow over the scene. People waited in vain for a long time for the reappearance of some sign of life in Baba’s body. At last, arrangements were made for the funeral. His body was carried to the cremation ground for burning. As soon as the body reached there, he was heard saying, in a lean voice, "Where are you carrying me? Take me back to my place." After that Baba became famous but he moved to a secluded place. Many people requested him to give them initiation but he only gave initiation to a few, after the insistence of his guru, Shri Haricharana Das Babaji, disciple of Shri Gaurkishora Shiromani. One day, one of Krishnachaitanya Baba’s disciples suspected that something had happened to Baba because when he used to say Jai Radhe everyday after paying pranam at Baba’s cottage near Chandrasarovar, but, on that day there was no reply. He consulted a Mahatma, who told him, "Absence of any response from Baba is not a cause for anxiety because Baba is so absorbed in Lila that he often goes into Samadhi and remains unconscious for house. But I saw one extraordinary thing happen this morning. I saw that Baba’s hut was aglow with a supernatural light such as I had never seen before. I do not know what kind of light it was. I never saw a lamp in Baba’s cottage." The villagers found Baba in an unconscious state. They held kirtan in an attempt to revive him but his state remained the same. Just then a pandit from Barsana came running with paan saying that Radha Rani has sent it for the Bengali Baba who is dying. As soon as the paan was placed in his mouth, Baba said, "Jai Radhe" and sat up but remained in a state of ‘divyonmada’ (divine madness) for several months. "He would in a fit of emotion sometimes laugh, sometimes weep and sometimes fall unsconscious on the ground. People thought he had gone mad. They took him to the Gwalior temple in Kusum Sarovar for treatment. In Gwalior temple, food used to be served on behalf of the Raja of Gwalior. As soon as Baba reached there he said, "I will not eat Raja’s food. Take me back from here." 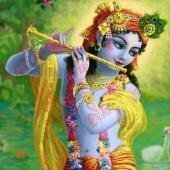 At last the time came when Radharani wanted to accept him in Her service. Baba came to know about it. He thought he should go and meet all the people, who were dear to him. So he went to Sesayi, Vansi and other villages, stayed there for some time and came back. On returning he said to Vrajamohana Dasa, "This time I told everyone while coming back that this was my last meeting with them. They were very much aggrieved. But what could I do? In the year 1940 on Kartik Krsna Astami, Baba left the body finally to take shelter under the lotus-feet of Radharani. 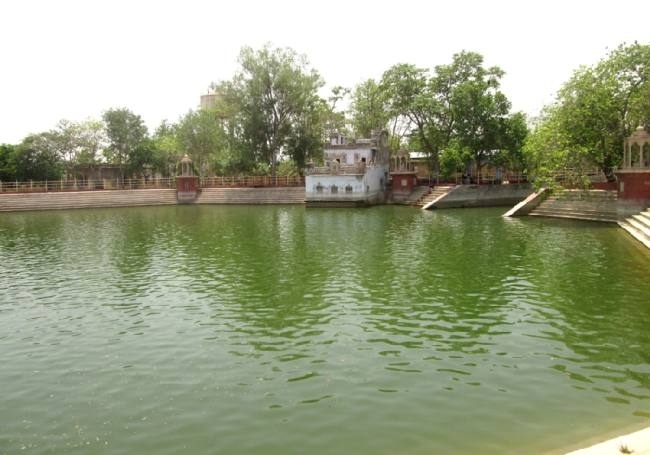 His Samadhi was laid in Chandrasarovar. Saints of Braj ki Jai!